Large Ladybird Cushion by Steiff is hand made in beautiful soft black and red woven fur. 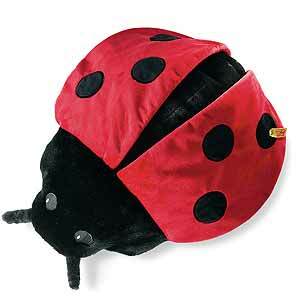 This lovely soft ladybird cushion, is great for youngsters, not only to play with, but to rest on. The small, 13cm zipped section, is located underneath of the cushion, which gives a small hidden bag for the little ones to keep their secret items.